'Secrets to Cooking TexMex'. Order your copy today !! BEEF BRISKET-Oven Baked. When the weather is just too bad to smoke one. BILL MILLER ICED TEA Clone recipe from the famous Bar-B-Q capital. CARNE MACHACA Tender cooked beef shredded for tacos or a la carte. CHOCOLATE CHIP COOKIES From the engineers at Texas A & M.
ENCHILADA CASSEROLE (Crock Pot) Quick and easy, the newest version. FIRECRACKER ENCHILADA CASSEROLE Similar to King Ranch Chicken. FUNNEL CAKES Batter poured through a funnel, then deep-fried. FRITO PIE A true Texas original as the Frito Lay company was born in Texas..
MENUDO The traditional cure for that morning after hangover. MESQUITE GRILLED CORN on th COB Great for summer cookouts. PAN DULCE Very popular Mexican pastry with a variety of flavorings. PECAN BARS Thick and chewy, these are great with a cup of coffee. QUESO BLANCO White cheese sauce that is great for dipping with chips. SPICY PECANS Roasted pecans with a hint of cinnamon..
TEXAS CAVIAR Black-eyed peas with onions, jalapenos, and seasonings. TEXMEX BAKE Better have copies of this recipe ready for your guests. TEXMEX QUICHE A unique blend of Southwest spices makes this dish have 'kick'. TOMATILLO SALSA A great tasting 'green' salsa that's easy to prepare. THIS PAGE AND CHECK BACK. 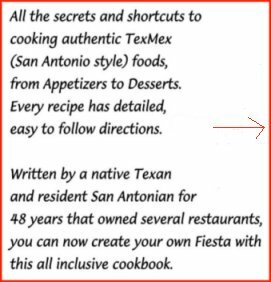 Looking for a particular TEXMEX recipe? REQUEST IT HERE!! recipes that are easy to prepare with step-by-step, detailed directions. Order yours today. The cost per each cookbook is $15.00 USD. 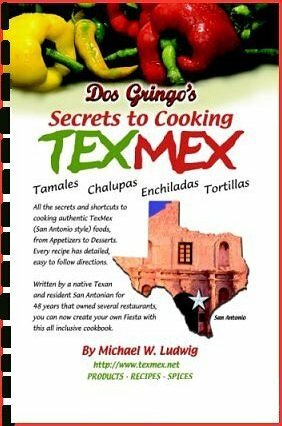 Copyright 1998-2011 "Secrets to Cooking Tex-Mex/Michael W. Ludwig. All rights reserved. This page last updated August 28, 2011.